And a great sign appeared in heaven: a Woman clothed with the sun, and the moon under her feet, and on her head a crown of twelve stars (Apocalypse 12.1). 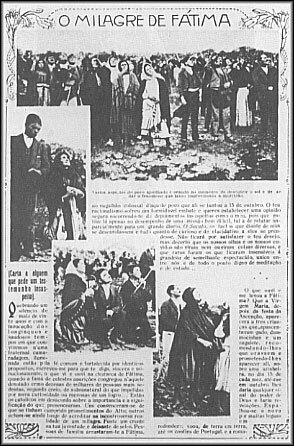 On October 13, 1917, the Woman [who] shall crush the head of Satan (Gen. 3.15, DRV) appeared again in Fatima, Portugal. But this time, Her apparition was like no other. This was meant for the whole world to take careful notice of and heed, for God stamped it with an unmistakable visible divine effect which astounded and confounded not only the general unbelievers, skeptics, and freethinkers among the crowd of the faithful assembled there on that day but even the organized Satanic forces (the Freemasons) then gripping the administration of the place and the whole of that country known as the “Land of Mary”. The miraculous manifestation, the visible, pre-announced sign, is about to show itself – many pilgrims insist. And then a spectacle, unique and incredible to one who is not a witness, is observed. From the top of the road… where there are many hundreds of people who were not inclined to trod in the muddy earth, the whole immense crowd [estimated by historians to be about 70,000] is seen to turn toward the sun which, free of clouds, is now at the zenith. The sun reminds one of a disk of dull silver, and it is possible to look straight at it without the least effort. It doesn’t burn, nor does it blind. ….It remains for those who are competent to speak out on the dance macabre [emphasis original] of the sun which today in Fatima has caused hosannas to burst forth from the breasts of the faithful and has naturally impressed – as I have been assured by people worthy of belief – freethinkers and others without interest in religious matters who have come to this now famous heath. – Avelino de Almeida [October 15, 1917]” (in Costa Brochado, famed Portuguese writer and political expert, Fatima a Luz da Historia, translated into English by G.C.A. Boehrer, Fatima In The Light Of History, WI: The Bruce Publishing Company, 1955, pp. 148-152). The famed Portuguese writer and political expert, Costa Brochado, observes: “Avelino de Almeida’s article, written intelligently, calmly, and objectively, caused a great reaction which will never be forgotten in connection with the history of Fatima” (p.154). And he concluded: “Miracle, as the people shouted? Natural phenomenon, as experts say? For the moment, that does not concern me, I am only saying what I saw… The rest is a matter for Science and the Church” (October 29, 1917, in Fr. Paul Kramer, ed., The Devil’s Final Battle, Good Counsel Publications, 2002, pp. 8-9). “What amazes us… is that the sun, a respectable star… also takes part in the affair and dances like a mad dancer in a wild country dance… For many years now, the sun has been considered, relative to our planetary system, as a fixed star… But now three boorish children come along and overturn scientific truth. Through their influence in the court of heaven, they cause the sun to dance over the chosen place of Fatima” (in Costa Brochado above). “The silver sun, enveloped in the same gauzy grey light, was seen to whirl and turn in the circle of broken clouds. The light turned a beautiful blue… as if it had come through the stained-glass windows of a cathedral, and spread itself over the people who knelt with outstretched arms… people wept and prayed with uncovered heads, in the presence of a miracle they had awaited. The seconds seemed like hours, so vivid were they” (in John De Marchi, The Immaculate Heart, NY: Farrar, Straus and Young, 1952, p. 143. “We suddenly heard a clamor, like a cry of anguish of that entire crowd. The Sun, in fact, keeping its rapid movements of rotation, seemed to free itself from the firmament and blood-red, to plunge towards the earth, threatening to crush us with its fiery mass. Those where some terrifying seconds” (Dr. Almeida Garrett, Professor of Natural Sciences at Coimbra University, in Frere Francois de Maries des Anges, “Fatima: The Astonishing Truth,” Book One of Fatima: Intimate Joy World Event, NY: Immaculate Heart Publications, 1993, p.178; also in Costa Brochado, op. cit., p. 178). “The sun, at one moment, surrounded with scarlet flame, at another aureoled in yellow and deep purple, seemed to be in an exceedingly swift and whirling movement, at times appearing to be loosened from the sky, and to be approaching the earth, strongly radiating heat” (Dr. Domingos Pinto Coelho, a renowned lawyer writing for Lisbon’s A Ordem, the official Catholic organ, in J. de Marchi, op. cit., p. 147). a. “If we are dealing with astronomical phenomena, they would unquestionably be recorded in the observatories, something which… did not happen. b.1. The poet Afonso Lopes Vieria, who was at home with his family in S. Pedro de Muel, some 30 miles from Fatima, testified that while working on his veranda at noon of October 13, 1917, he was surprised to see an astounding solar phenomenon so that he enthusiastically called to his wife and his mother-in-law to come and see. Later, his widow Senhora Helena da Aboim Lopes Vieria confirms his words. She explains that with the others she hurried she hurried to the veranda and from there they observed the wonderful sights which they later knew had been produced in the Cova da Iria (C. Brochado, ibid.). b.2. 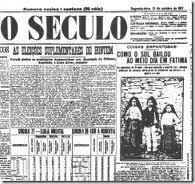 In another direction, in Alburitel, a place about 9 miles from Fatima, the schoolteacher Senhora Delfina Pereira Lopes ran out greatly excited to the street, with her charges, at noon, on October 13, 1917, for they had seen the terrifying movements in the sun. There in the middle of the street, the shouting and crying townspeople thought the world was coming to an end and they prayed the Rosary in chorus (ibid.). Mr. Brochado concludes: “These cases [of which sworn testimonies contained in the official transcripts of the diocesan investigation – concluded on October 13, 1930 – were published by The Catholic Register, July 1931] surely dispose of the allegations of collective suggestion of the crowd which was in the Cova da Iria, and they also prove that the solar phenomena observed there were not purely local” (p. 186). 6. The Miracles in Portugal after its Consecration to the Immaculate Heart of Mary (See Section 5.b. of our post When Mary Comes… (III). “The third [Jewish] attempt to amend the Christian position, after the failure of reformed Christianity [i.e, the 16th century revolt of Martin Luther subscribed to up to this day by the several thousands of conflicting “Bible-only”-based sectarians — the Discalced Carmelite Friars] to unite, took place under the impetus of the French Revolution [of 1789]… which marked the beginning of atheism in the history of Christian peoples. Declaredly anti-religious, this Revolution continues, through the influence of Russian Communism, to make a powerful contribution to the de-christianisation of the Christian world [an important ‘spiritual’ leader of the Synagogue of Satan categorically identifies the Christian world with the Roman Catholic world; earlier, Mr. Jehouda admitted in effect that the “Bible-only”-based ‘Christianity’ is nothing but the Synagogue’s dummy and its failed counterfeit Christianity at that! ]” (L’Antisemitisme, Miroir du Monde, [British Museum reserve] 1958, pp. 170-2). 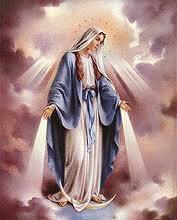 In ending her October 13, 1917-apparition in Fatima, Portugal, the Immaculate Conception was last seen as Our Lady of Mt. Carmel by Lucia (who became Sr. Maria Lucia of the Immaculate Heart, C.D. in Teresian Carmel). Later, on August 15, 1950, when interrogated why the Woman made Her final appearance as Our Lady of Carmel, Sr. Lucia replied: “Because She wants all to wear the Scapular.” Clearly, Our Immaculate Mother wants all to become members of her Carmelite family of which Her Scapular is the sign of membership. Yet greater still, the Brown Scapular, according to Pope Pius XII, in his apostolic letter on the commemoration of the seventh centennial of the apparition of the Woman to St. Simon Stock, is “the sign of Consecration to the Immaculate Heart of Mary… particularly recommend[ed] in these perilous times” – it is the visible Badge of Victory and Salvation of the rest of the seed who under the standard of the Immaculate Conception shall crush the head of the ancient infernal serpent so inimical to the salvation of humankind and who shall deceive if possible, even the elect (Mt. 24.24) in this end-times. Membership in Her Carmelite family today is, regrettably, generally characterized by the simple wearing of the Brown Scapular and, most often than not, based on a shallow, if not false, devotion to this Immaculate Mother and “Queen Beauty” of Carmel, namely, to secure Her aid, protection, and intercession in a material and physical sense only thereby making Her Scapular a sort of talisman. Way far off from what our Immaculate Mother desires of Her children! This is the ordinary state of Scapular wearers: the passive wearing of the holy Carmelite habit – a state though may be pious still, being a silent devotion, but not where Satan and his forces is utterly impotent to vanquish if possible even the elect. Our Immaculate Mother calls for a legion of elite Roman Catholics who would position themselves in the vanguard to engage in what Our Lady of Fatima calls the “decisive battle” against Satan and his forces. As St. Maximilian Kolbe’s Militia Immaculatæ (“Knights of the Immaculate”), they would live and propagate God’s saving design of Consecration to the Immaculate Heart of Mary. Join Her Scapular Confraternity (click here or go to our Pages section below) and live her Message at Fatima! Delay not to be converted to the Lord, and defer it not from day to day. For His wrath shall come on a sudden, and in the time of vengeance He will destroy thee (Ecclesiasticus [Sirach in the New “Catholic” versions] 5.7-8). This entry was posted in Christian Life, Sacred Scriptures, The Blessed Virgin Mary, Traditional Roman Catholic Order and tagged Apocalypse, Blessed Virgin Mary, Brown Scapular, Carmelite, Carmelite Spirituality, Catholicism, Christian Life, Christianity, Immaculate Conception, Immaculate Heart of Mary, Our Lady of Fatima, Our Lady of Lourdes, Our Lady of Mt. Carmel, Roman Catholic Church, Roman Catholicism, Traditional Catholicism. Bookmark the permalink.